From the left a sand tiger shark approaches, from the right a southern stingray. Suddenly a nurse shark comes up from behind and passes about a meter over the diver's head. Diver Jen looks ahead, takes a deep breath and gives the OK-sign. "Hi and welcome to Newport Aquarium's dive show! ", she greets the audience behind the acrylic glass window of the Cynergy theatre. The area around Cincinnati in the Midwest of the United States is not exactly known as an eldorado for divers. It is located hundreds of miles from the nearest coast, the distance to the Great Lakes is roughly the same and the closest lakes suitable for divers are about an hour's drive away. 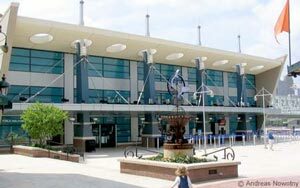 There is, however, one attraction for divers: Newport Aquarium, located in Kentucky opposite downtown Cincinnati on the south bank of the Ohio River. The planning of the aquarium began in 1990. It was the brainchild of five local businessmen who wanted to share their interest in underwater flora and fauna with their fellow citizens. Seven years elapsed before the laying of the foundation stone but afterwards it only took 18 months until the aquarium finally opened its doors to the public on May 15, 1999. The visitors stroll through 12 different galleries, ranging from rivers from around the world, exhibitions about bizarre and beautiful creatures like the Giant Pacific Octopus, the flooded forests of the Amazon to a coral reef with its variety of tropical fish. The absolute climax of the walk through the aquarium is the gallery "Surrounded by Sharks", a walk in an acrylic tunnel through a shark tank. 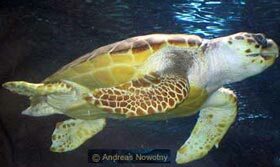 It is a fantastic opportunity to observe sharks, rays and loggerhead sea turtles up close while still staying dry! A distinctive feature of the tunnels is that, in contrast to similar ones, they were built seamlessly in one piece, thus affording the illusion of being totally immersed in the water, without being distracted by lines on the glass. These tunnels are really great: in some parts the visitors are surrounded by water from above and below, left and right, just as if one was diving among sharks. 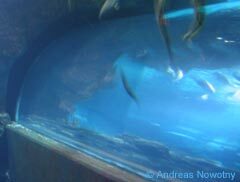 Unfortunately, however, it is only an "as if" - there is not only water between visitor and shark, but also acrylic glass and air. Wouldn't it be great to really dive in a shark tank? Divers in the greater Cincinnati area have this opportunity at the Newport Aquarium! A major aquarium like this can't function without a sizable number of volunteers to help with the daily tasks. 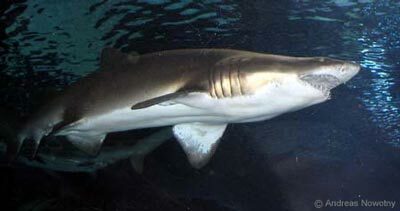 Newport Aquarium offers two options for possible volunteers. "Dry Volunteers" ensure that the visitors have a great and informative time at the aquarium. Part of their duties is to answer questions, point out interesting exhibits, share environmental messages and to be the friendly face of Newport Aquarium. The second group, which is especially interesting for us divers, is that of the "Wet Volunteers". Behind the scenes and in the tanks these specially trained divers take care of everything connected with the big tanks. Jennifer Rehberger, dive coordinator for the volunteer programme, talked to me about the origin and development of this programme and about the tasks involved. While the aquarium was built, the question of how to implement the volunteer programme was being considered. Although this is done in-house at most other aquariums of this kind, it was decided to outsource the organisation of the volunteers to the Cincinnati dive company Scuba Unlimited. In this way it was possible to benefit from the know-how of an established company, which could service the required equipment and which had considerable experience in underwater maintenance. The dive equipment manufacturer Mares was also taken on board. They support the organisation with equipment and their local representative is also a "wet volunteer". How do you become a wet volunteer? "With lots of luck, as we have a waiting list of about 100 applicants at the moment," Jennifer Rehberger answers with a smile. Right at the beginning of the programme over 500 divers applied, showing how attractive a job as a volunteer aquarium diver is. A further indicator for this is that volunteer fluctuation is extremely low. Out of the 35 volunteers who have been with the aquarium right from the start, 29 are "wet volunteers", just over a quarter of the divers employed today. "One of the great things about our volunteers is that our divers aren't one homogeneous group, but consist of people from all walks of life and lots of different age groups!" is Jen's answer to my question about the "typical" volunteer. "In our organisation there are mothers, managers, teachers, air traffic controllers and other staff from the airport nearby, students and pensioners, ranging in age from 18 to 75. At the moment there are more male than female members, but that is changing!" The requirements for the actual application are not that high: applicants need to be at least 18 years of age, have the Advanced Open Water certificate and need to have completed a CPR and a First Aid course. 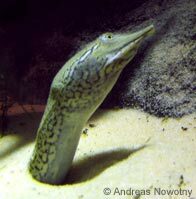 The actual selection process consists of a written exam on diving theory, including questions on underwater life. This is followed by an actual diving assessment where special emphasis is put on the applicant's buoyancy control. Those who manage to pass these tests are then interviewed again in order to see if they would fit personality-wise into the existing volunteer team. If a candidate manages to get admitted to the group of "Wet Volunteers", it doesn't mean that he or she is allowed into the shark tank straight away! 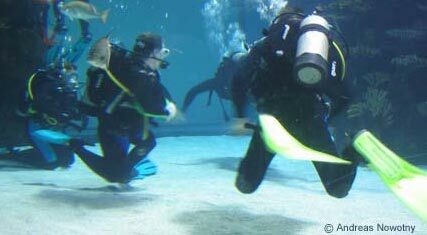 First of all they need to go through some special training which was especially devised for this aquarium. The programme was developed in-house, and was fine-tuned during the first year. During the development phase, before the first volunteers were taken on, the training officers also went to other aquariums to see how they handled similar programmes and to get suggestions for their own training. Over the years this training programme has proved to be very efficient and met all expectations, so the trainers in charge are more than satisfied. The programme consists of a theoretical part, including a manual devised by the trainers with an accompanying video, an observation phase and practical dive training. Obviously enough practical diving competence, especially excellent buoyancy control, is exceedingly important in such a fragile environment as these tanks. It is therefore not surprising that excellent buoyancy control plays such a big part both in the initial selection process (in the form of a dive obstacle course) and the training programme of the volunteers. Another aspect is the interaction with the aquarium's life forms - not only the swimming exhibits, but also the paying customers! Wet Volunteers have to be able to answer visitors' questions about the creatures in the galleries and (as opposed to volunteers in other aquariums) are supposed to interact with the visitors when they are diving inside the tanks. Sounds great so far? It is! 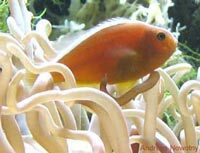 However, you mustn't forget that these volunteers play an important part in the daily running of the aquarium. "We expect our volunteers to work at the aquarium for 4 -5 hours at least once a month," Jen Rehberger explains, "although most divers do, in fact, invest more time into their duties than that." At the start of their working day the volunteers log into one of the terminals with their personal code. They then check the notice board for general messages and to see if there are any special requirements which need to be taken care of or need to be observed that day. "Although there are, of course, many routine jobs, there isn't really a typical day with the same jobs all the time. Our volunteers do whatever needs to be done on the day they come in." A typical job that needs to be done regularly is the production of the fish feed. As attractive as the job of a wet volunteer sounds in general - in this case it consists of (among other things) the cutting up of fish heads. In the preparation room there are instructions for each of the individual tanks, stating how much of what kind of feed has to be produced. After the job is done, the feed is put into the cold storage room for intermediate storage. The helpers also carry out the actual feeding of the fish. As well as the food preparation, cleaning is one of the main jobs. If you have a small aquarium at home you can imagine how much work is needed to keep all those tanks of different sizes clean! Cleansing the plants, keeping the acrylic tunnels in a perfectly transparent state and hydro-cleaning the tank floors are therefore regular activities for the volunteers. Their fields of responsibility in this respect include the shark tank, coral reef, kelp forest and Amazon tanks. Apart from these more manual chores there is also the area of edutainment. The divers are supposed to entertain the visitors as well as pass on their knowledge on the plant and animal life within the aquarium. A big part of this is the dive show mentioned at the beginning of this article. The audience is seated in a cinema and is introduced to diving sign language by a presenter who also teaches the audience the big "OK" sign. Then the cinema screen is lifted and the audience sees right into the big shark tank through a huge acrylic window. A diver with a full face masks kneels on the tank's floor in front of the window; behind him or her there is a safety diver. After an exchange of OK-signs with the audience, the diver gives a short introduction to the big tank, followed by a round of questions. While the diver answers the questions and the sharks swim placidly above the divers' heads, sometimes the audience (in this case including me) can witness how the safety diver has to fend off nosy animals like a brash Loggerhead turtle! 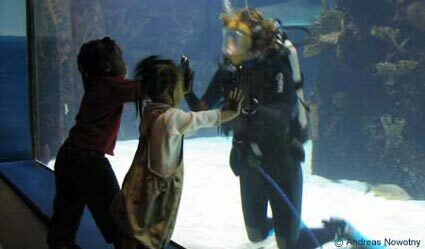 Later, while in the tunnel, when the visitors see divers, it is the smaller kids in particular who enthusiastically exchange OK signs with them. I can imagine that perhaps the foundation for a future dive career may be laid here. The show started about a year ago and now runs successfully four days a week. In order to answer the audience's (and other visitors') questions competently, the volunteers need to have a wide range of knowledge. Their education is therefore not finished after completing the training programme, but is a continual process. Part of their time at the aquarium is spent observing the animals and extending their knowledge. Each time a different animal is studied closely so that over time the volunteers accumulate profound knowledge about each of the animals, knowledge which they can share with the visitors. 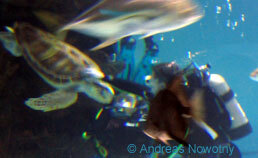 Part of this continuous training is also a diver exchange programme with other aquariums. Not only is this a chance for divers to get to know other aquariums in America and to get to know animals not kept in Newport, but by gaining insights into other volunteer programmes they expand their horizons and start to see themselves as part of a greater group. Finally I asked Jen what motivates people to give up some of their spare time to help at the aquarium (leaving aside the thrill of being able to dive in a shark tank). "There are hardly any good places to go diving around Cincinnati. There are quarries where diving is possible, but they are about an hour's drive from here. Many of our volunteers therefore see the time spent at the aquarium as a balance to their jobs and use some of the time to just go diving and to unwind. There is a great opportunity to do this in the mornings before the aquarium opens to the public!" And what would the volunteers say their main motivation is? "I think," says Jen after a moment of consideration, "most of them would say that the best thing about their job is to ensure that visitors have a great time and to make them, and especially the kids, laugh." Is that her motivation, too? "Yes, of course. 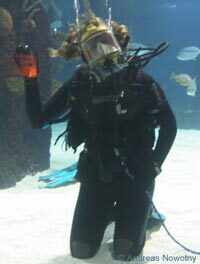 But," admits Jen, "I get the greatest kick when I introduce new divers to our programme and observe how they get hooked!" If you are anywhere in the vicinity of Newport or Cincinnati go and visit Newport Aquarium! I can really recommend it and even rate it higher than the one in Sydney! You can get a first impression on the website of Newport Aquarium. The volunteer divers are assisted by Scuba Unlimited and coordinated by Jennifer Rehberger, whom I would like to thank for taking the time to do this interview.